Members of the Chicago Teachers Union hold an informational picket outside Willa Cather Elementary School on Monday in an effort to call attention to ongoing contract talks with the city's Board of Education. The Chicago Teacher's Union voted unanimously Thursday to strike on Sept. 10, with members agreeing to head to the picket lines unless a deal can be reached with the city’s schools -- a move that could affect 400,000 students. The result of the ballot, cast at a Chinatown union hall, was met by cheers from the more than 700 delegates who voted. 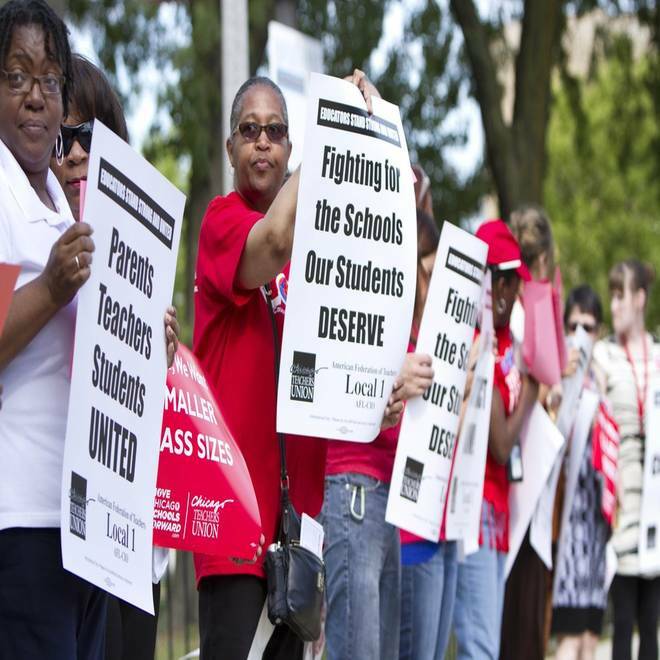 The decision comes a day after CTU president Karen Lewis issued a 10-day strike notice. Sept. 10 is the earliest that teachers can strike, and the date falls a week after many students head back to class. "We're tired of being bullied, belittled and betrayed," Lewis said at a news conference following the meeting. "We have done everything asked of us, yet we continue to be vilified and treated with disrespect." Lewis said negotiations will continue until a contract is hammered out that resolves concerns over wages, job security and a new evaluation system. "Should CTU leaders decide to strike on September 10, more than 350,000 students will be taken out of their classroom, just as they're making progress with a Full School Day. Varsity sports for 11,000 student athletes will be suspended. More than 400,000 daily breakfasts and meals will no longer be served. 6 July: Students who suffer from drug and alcohol addiction are finding help at special schools where the kids work toward common goals: education, graduation and recovery. NBC's Kate Snow reports. “College transcripts and recommendations for 20,000 seniors will be put on hold. If our priority is our kids, then strike should never be an option. That's why we need to take advantage of each of the next 11 days and work until we reach a fair resolution for our teachers that will allow our kids to stay in school where they belong." CPS officials have been making preparations in the event of a strike. Brizard said the district plans to keep 145 schools open for half-days even if the Chicago Teachers Union calls a strike and teachers walk off the job. The union on Wednesday filed a 10-day strike notice that would allow them to strike as early as Sept. 10, just a week into the school year for a majority of public-school students. If that happens Brizard said CPS will partner with City Sister Agencies, local faith organizations and other non-profits to keep kids engaged. "We need to be prepared to provide our students with services they need should CTU leaders decide to strike, and our Children First plan will do that," Brizard said. As part of the precautionary strategy announced Thursday, CPS would keep the group of schools open from 8:30 a.m. to 12:30 p.m. Monday through Friday to provide activities to children and keep them engaged in independent reading, arts, sports and computer-based programming. 27 June: The City of Stockton, California, is likely to become the largest municipality to declare bankruptcy in an effort to deal with a $26 million deficit and $700 million in debt. Cnbc's Jane Wells reports other cities may soon follow suit. Per the plan, the schools would be staffed with Central Office personnel, non-CTU employees and organizations that submit a request for proposals to provide programming. Brizard said the staff-to-student ratio would be capped at 1 to 25. CPS also said it will provide breakfast and lunch to all students at the locations and will extend between 70 and 80 Chicago Park District summer camps. Brizard said he's committed to avoid a strike but says CPS will be ready if the teachers strike. CPS said it is seeking a waiver from the Illinois High School Association to continue sports if teachers strike.